I've been waiting to do this post for a long time now, and finally all the stuff I ordered has arrived! So, let me introduce MY FIRST GIVEAWAY! I'm really excited about this, even though it's cost me a fair bit, lol. 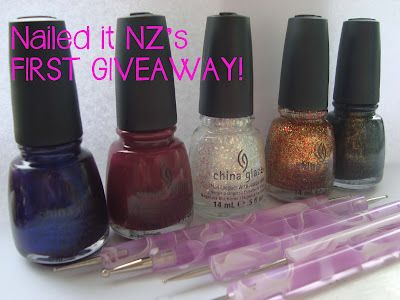 I don't know about everyone else, but here in NZ nail polish is expensive! Set of five dotting tools from Born Pretty Store. The best thing about this giveaway, I think, is that I can vouch for all of the items. I have all the same polishes, and they are all amazing! I've done swatches and mini-reviews of them all, so check them out at the end of this post. Also, this is open INTERNATIONALLY! I've used rafflecoptor to do this giveaway, it's my first time doing it but I think I know what I'm doing! Biggest thing to note here: DO NOT CHEAT. Aka, don't say you've done a blog post about it when you haven't, don't say you've followed me when you haven't. I'll be checking and double checking the winners, and if you've cheated at all I'll discard all your entries. Comprendo? Let's play nice. Five amazing nail polishes and five dotting tools with different sized tips! And here are my swatches of them. 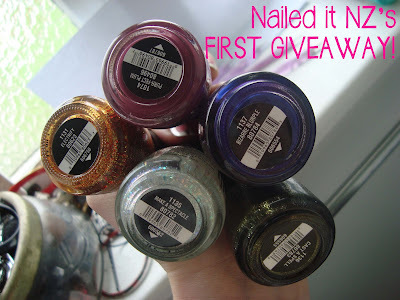 I used my polishes of these colours to do it - the winners prize is brand new! IMPORTANT: The winner will have 48 hours to get back to me after I've contacted them so make sure you check your email and spam inbox! So basically, I might be giving these away twice. Maybe I'll do a NZ only nail art competition or something. Thank you! I can't wait either! Also, my favorite post is your horse nail art - it's so cute and I LOOOVE horses! Thanks! It'd be awesome if you did! Haha, I kind of hope someone else from NZ will win, will certainly save shipping costs. And thanks, they're one of my favourites too! Congratulations! I have to say I love the rainbow nails, they look amazing!! WHY DOES EVERYONE I KNOW HAVE SECRET BLOGS?? That's two people in the last couple of weeks. Crazy. Thanks! Kind of hope you win as you were probably one of my first "followers." I love that you've read my first post! :) Yea, I still find it hard not to pick at them and can't keep the same nails on for long... but at least new nails everyday is good for my blog! Reading through my first post makes me realise just how much I've changed my mind about OPI nail polish though, I love it now! Great giveaway and awesome prizes! I really liked your recent Halloween post with the cupcakes! Your eyeballs were really cool! Thanks! The cupcakes were delicious! Awesome giveaway, thanks! I liked the army camouflage design you did. Amazing giveaway! The rainbow nails! It caught my eye when I saw it as your display picture and it's amazing that you did it freehanded! I think it was the first post of your I ever read also! Thanks! I've kept it as my display picture because of that, haha. Thanks for entering my giveaway! Nail polishes are expensive where I am too!! So I definitely know what you mean! It gets easier every time you do it, really. I think I've done that mani four times now! Thanks for joining my giveaway! That one's been pretty popular I must say :) Thank you! Love all your nail art! But I like everything else too! Great giveaway! It's one of mine, too! Thanks! Love your blog... I can't believe you're only now hitting 100 followers I thought you'd been around for much longer! :) My favourite post off the top of my head is your despicable me minions! Nope, I'm only just starting out really, only been up five months! Thanks! My favorite post was the vintage rose pattern mani! I loved the color scheme. I thought it would work with a lot of different outfits (if matching your nails to your clothes is something you do--like me :P), and it was cute without being overly girly. Thank you! I really liked that one too, but it wasn't particularly popular! It was a lot more subtle then some of my other ones. And yeah, I love matching my nails to my clothes every now and again! Wonderful giveaway, thank you! :) My favorite post is the Converse nails (take two). I think it's so fun! Thanks! They were lots of fun to do! Yeah, it's just not fair otherwise. Awesome, I'm checking it out now! I love your Pacman nails! i like Dolphin nails (with tutorial)!! I love the converse shoes nail art and the penguins too. You are so gifted! I love your nail art- especially your recent competition entry! Gorgeous! The converse shoes were awesome! The Dolphin nails post is adorable! Wow!! Love China Glaze polishes and they are so difficult to get here. hope I'll win! Oh boy, normally I reply to all my comments but I'm running out of steam on this one! So I won't reply for any more of these unless they're particularly long or interesting - but I'll read them all though, and thanks! My favorite post is your "Rainbow nailsa nd hot pink cat." Thanks for the giveaway and congratulations! How exciting! One day I'll hit a landmark in my number of followers and then I can do a giveaway. Looking forward to it! What a lovely giveaway! I think my favorite is your Pacman nails! My favorite post is the apple nails! They're so cute! Converse shoes/chucks take two! !its perfect!! Taylor swift nail art. Love her, the song, the video and of course your nails!! i like Dolphin nails (with tutorial)!!!!!!!!!!! I LOVE the Halloween cupcakes with matching nails! Too Cute!! I love the Halloween cupcakes with matching nails (Halloween nail art is the BEST) and the 1st studded manicure. Thank you! i like A-Z about me! that was interesting! Love the giveaway :) and all of your nail art! I love the Rainbow nails and a hot pink cat, and your first Fish tail (braided) nails -such amazing harmony of colours! Really like the studded manicure! Something unique! Since i am new & love halloween I'm gonna say halloween cupcakes & matching nails! But I am enjoying your blog bc you do great work!! Great Giveaway! I really like your Taylor Swift Nail Art mani... looks amazing! I've really liked your post with the nail studs, your matching Halloween nails and cupcakes, and your A-Z info post! I like Introducing the nail polish that ruined my nails. I have that Jordana nail polish but have not used it yet. Thanks to your post I will be avoiding it!! My boyfriend is obsessed with converse shoes so I think he'll like this mani when I try it! The converse shoe tutorial. Cute! I love the Pacman Nails tutorial!! Just discovered your blog. Found through Chalkboard nails. Can't wait to browse the rest of the site. water marble nail art. even though i never could get it right! it takes practice and patience! I love the post - Halloween Cupcakes and matching nails! -- Very creative! I like the rainbow nails, so gorgeous! Awesome giveaway, thanks so much! I love your rasta nail and taylor swift one. Thank you for your giveaway. I like your nails tutorials. My favorite is the "studded manicure". I tried my very first one the other day, though I just did accent nail instead of all of them. It didn't last very long on my nails because I used little gemstone things that stuck way out. But it looked awesome! I loved the cow nails. They are so youthful and funny. Thank you so much for throwing this!